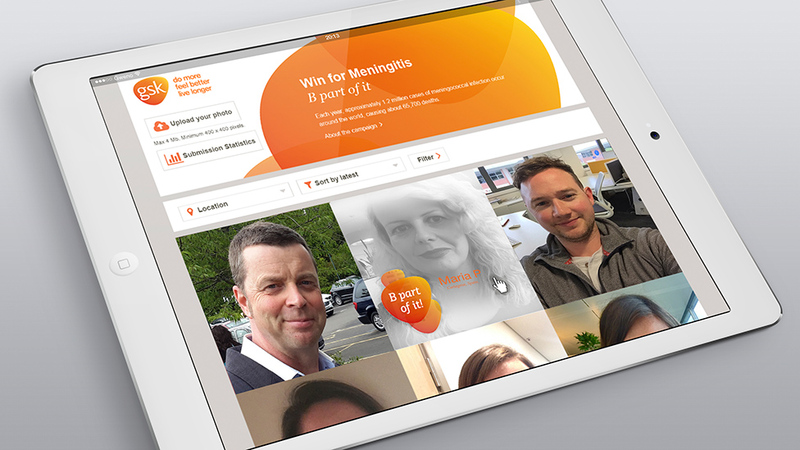 The employee engagement web app we created for GSK helped the global leader raise internal awareness about World Meningitis Day. Our client, a global leader in vaccines, medicines and consumer healthcare products, came to us to help them create an intranet website that would help them drive engagement among their employees for World Meningitis Day. Meningitis, a damaging brain and spinal cord disease, affects over 3,000 people every year in the UK alone. Victims of meningitis present symptoms similar to those of other less damaging diseases, which can result in misdiagnosis. Internal, as well as consumer, awareness is therefore extremely important given that sufferers’ symptoms can develop into the life-threatening condition in just 24 hours. To energise the target audience, we needed to created a user-friendly web application that would encourage employees to celebrate their role in developing life-changing Meningitis vaccines. Although only available for internal use, due to the sensitive nature of the healthcare research, our design and development solution created a platform for employees to share photos of their personal contributions. The front-end design created by our digital team was a creative and user-friendly extension of the client’s brand that was developed to maximise staff engagement. As well as being able to upload photos quickly and easily – providing insight in real time on the research progress made by colleagues – employees gained a greater understanding of their role in the development of life-changing vaccines. The user-friendly web app and relaxed digital environment improved employee interaction by leveraging activities and features that users were already familiar with from other social media platforms: commenting, sharing, liking. Included image editing functions that allowed employees to crop and adjust photos to highlight key elements and emphasise information that would have the biggest impact on their colleagues. Site is viewable on all modern browsers, and the crop functionality incorporates touch support. The intranet website also allows users to sort image results chronologically or by location. As the images shared may contain sensitive or confidential healthcare information, securing the information, while maintaining flexibility for users, was a major consideration. The website was custom built on LAMP stack, a powerful web application platform, and the photo wall features a 1:1 aspect ratio that helps users focus on the subject without room for distraction. The client was extremely pleased with the employee engagement web app and it was successfully launched as a central component of the company’s celebrations for World Meningitis Day.